At the Linden City Council meeting of Thursday, October 29, Linden Heritage Foundation President, Sam Higdon, asked for appointment of a Linden Main Street Program Committee consisting of members of the City Council, Linden Heritage Foundation Board, Linden Economic Development Corporation, and other interested citizens to re-apply for selection in the 2017 Texas Main Street Program (TMSP). The City applied for a designation 5 years ago, which was approved but not pursued. Five members of the Linden Heritage Foundation enjoying the red carpet treatment in Mount Vernon, a city that has revitalized significantly since becoming a Texas Main Street City. Pictured, left to right, are Mary Dowd, Catherine Knapp, Joe Lovelace, Sam Higdon, Carolyn Teague (Mount Vernon Main Street Manager), Sue Lazara, Mary Lou & Gerald Mowerly (Board members of the Mount Vernon Old Depot Museum), and Lilly Bush (Editor of the Optic-Herald, local historian, and advisor to the Mount Vernon Main Street Alliance). 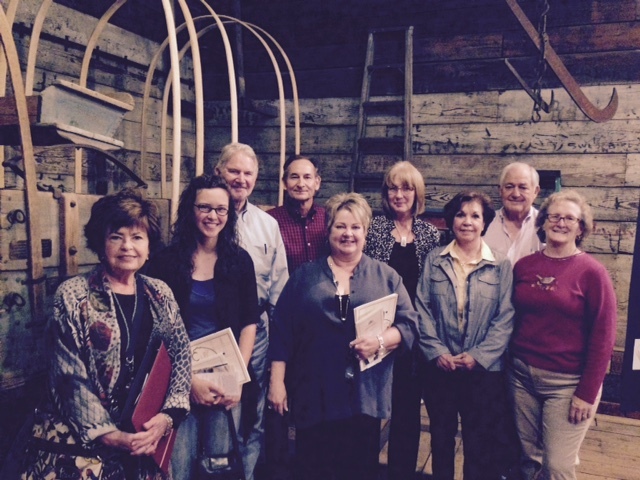 Foundation members met on October 29th with City official in Mt. Vernon, Texas to view their Texas Main Street Program (TMSP). The Texas Historical Commission, through the Main Street Program, assists historic commercial areas in cities to develop a public/private effort to revitalize their downtown. Higdon indicated this effort would attract future commercial development of the water tower and firehouse. The mission of the TMSP is “to provide technical expertise, resources and support for Texas communities in the preservation and revitalization of historic downtowns and commercial neighborhood districts in accord with the National Main Street Four Point Approach® of organization, economic restructuring, design and promotion.” TMSP staff work on a daily basis with 87 designated communities to help them reach revitalization and preservation goals. This is a proven methodology which provides the tools for local communities to effectively address the issues downtowns face. Twice a year, the Texas Main Street Program (TMSP) holds professional development and training for its local Main Street managers and their volunteers. Additionally, the TMSP partners each year with the Texas Downtown Association to hold an annual statewide downtown revitalization conference. The annual conference is open to anyone interested in downtown revitalization. The upcoming conference will be held November 3–6, 2015 in Waxahachie, a 19-year designated Main Street community. See more at: http://www.thc.state.tx.us/learn/training-consulting/texas-main-street-program-workshops#sthash.utzfA7yd.dpuf .